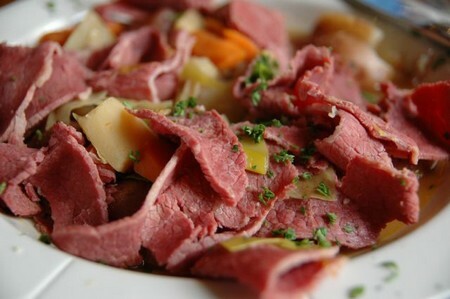 Corned beef is a long standing favorite meal. Making corned beef can be a task. However, there is a very easy way to prepare this meal, use a crock pot. There are many other recipes that call for additional things like vegetables, potatoes and other ingredients. This is the basic recipe for corned beef. There is not much added into the crock pot with the exception of some gravy. This way, you can add this beef with whatever separate side dish you want. You don’t have to run into the problem of having the flavors of the other ingredients being over powered by the bold tastes of the tender corned beef. Here is how you can cook corned beef in a crock pot. Take the corned beef out of the original package. Place the spice aside in a place that you can easily find. Use a non stick spray like Pam. Coat the bottom and sides of the 5 quart crock pot. If you don’t coat the crock pot with a spray then the brisket will stick and may clean up difficult. Cut the fat layer from the lower part of the corned beef brisket. Be careful not to remove all the fat or your brisket will dry out during the cooking process. Do you remove the big strip of fat, though. Cover the entire brisket with water. Place the corned beef inside the five quart crock pot. Add water to the crock pot until the entire piece of meat is covered. The water needs to be enough to just cover the brisket. Cut open the spice packet that came with the brisket. Put the seasoning into the water and on the brisket itself. You need to cook the corn beef brisket for about ten hours. It’s good to start and let it cook over night. You can allow the corn beef to cook a minimum of eight hours. However, after the recommended ten hours have passed, then you can enjoy the brisket at your next dinner. You can dress this crock pot corned beef up with any of your favorite side dished. You can have potatoes, rice, vegetables or go the basic way and make sandwiches. Enjoy your tender, crock pot corned beef.